Café fitouts and refurbishments can be a trying time, because you need a layout that welcomes customers and makes them feel comfortable, whilst at the same time increasing employee efficiency. As a business owner you have a responsibility to offer a healthy, safe and pleasurable work space for your employees and a safe environment for your customers. This brings us to colour and furnishing, both of which need to reflect the idea you have for your café and for your branding. Colour is one of the most important factors in branding your café and since hospitality fitouts can take a large chunk out of your budget, you want to make the right choice at the very beginning. Did you know that every year Pantene announces the colour they predict will be not only popular, but will trend heavily in the design world? If you are looking for design inspiration for your new café fitout, then this can be a great resource that helps you to create a cohesive design that offsets your branding. It’s fair to say that we all know how influential colour can be in our lives and if you pick the right colour for your refurbishment, you can have a gold mine on your hands. Well, maybe not a gold mine, but colour does affect our mood, doesn’t it? 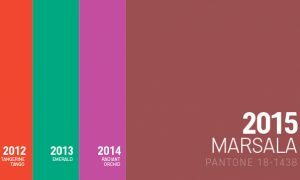 So how does the new Pantone colour for 2015 stack up? Well this year their pick is Marsala (#18-1438 if you need to know these facts). Pantone states that this colour is impactful and full-bodied, and will make an elegant and grounded statement when used on its own or as an accent colour. 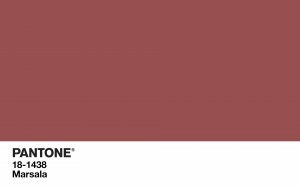 How will Pantone’s new colour effect your cafe fitout? Well, Marsala is an earthy, rich red/brown colour which when used as an accent, lends itself perfectly well to cafes and restaurants that want to imbue a sense of comfort, warmth and home cooked meals to their branding. If your store specialises in freshly squeezed juices or you are a noodle bar for example, then Marsala is not really going to be the best colour for you – try limes or greens instead. Marsala is more like a plush blanket that keep you warm, a roaring fire and a hot toddy or a succulent roast and a large glass of full bodied red wine. If these are the feelings you want your customers to sense as they enter your café, then Marsala might be the key to your new refurbishment. So think of reds, browns, navy blue, dark timbers, stone work and glass with a background of cream or chantilly lace to ground your colour scheme and lift the ambiance. Marsala is a robust, organic colour that suits itself well to a sophisticated décor that emphasises creativity, whilst grounding itself in history, permanence and tradition. Not everyone likes the same colour palette, so you might not please everyone, all of the time. Marsala though, certainly gives us food for thought. For more information on hospitality fitouts, refurbishments and café fitouts in Sydney, call Liteco Projects, interior design specialists on 02 8068 1755, email us: info@liteco.com.au or complete our online enquiry form.